Getting More Views on Blogger/Blogspot from the USA, UK, India, etc. What is Quora and how to use it to gain more views and revenue? If you have a blog on blogger or blogspot, then you are really worried about how to get more views on it. Well, there are a number of ways to SEO your Blog. Here, I will be talking about the Quickest Way to get more Views on your Blogger/Blogspot. Before we go into the details of the post, if you are wondering how to create a Blog and make its basic settings so that it could be optimized, then you should check out this post. Getting views on a WordPress Site is comparatively easy and quick as compared to a Blogger/Blogspot site. I’m sure you have observed that all the ranked (top searched sites on Google, Bing, etc) are NOT Blogger/Blogspot sites. Still, there are ways to get more quick views on your blog. At the start of the video below, I have shown you (as proof) that I have gained more than 10,000 Views on some of my new posts at a blogger/blogspot site. Also, if you see the statistics, mostly view on the blog are from the USA, India, UK, etc. Countries like USA, UK, etc give very higher CPC (Cost Per Click). Now, you are wondering what is the method I use to get more viewers on my Blogspot/Blogger Posts (Keep it in mind these posts are not ranked top in Google, yet these have good views). But, these will be ranked with the passage of time. Ok, the method I use is by using Quora. As shown below, Quora is the main source of getting more views on my posts that too from the USA, UK, and other Top CPC Countries. Also, when we talk about main Referring Sites, Quora is at the top of the list. Quora is a question-and-answer site where questions are asked, answered, edited, and organized by its community of users. The company was founded in June 2009, and the website was made available to the public on June 21, 2010. Users can collaborate by editing questions and suggesting edits to answers that have been submitted by other users. Now, once you write any post on your Blogger/Blogspot or even WordPress Site, search the same topic on Quora. You will see different recommended questions those need to be answered. Choose the most appropriate question and copy your blog post and paste it into its answer. If you paste your blog post in Quora and giving direct links to your site, it will be against the Quora Policies and your post will be deleted and having continuous violations you could be banned from Quora. 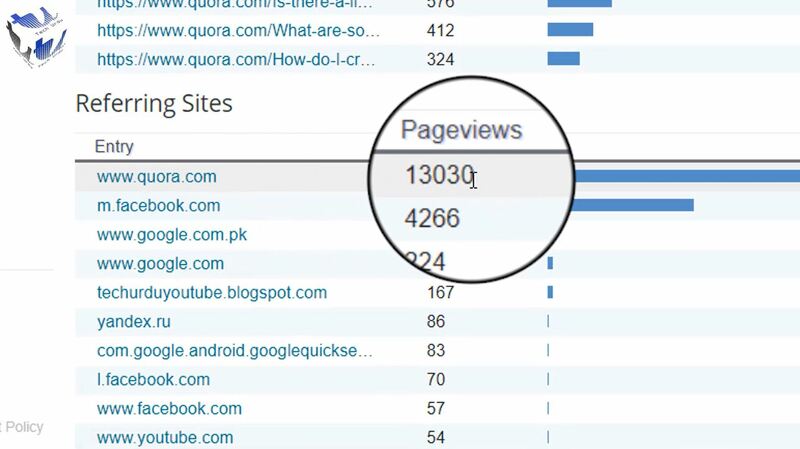 Also, keep it in mind, if your post is viewed in Quora, this will not be counted as a view on your site (to get views on your blog, the viewer must visit your site). To do so, don’t paste the complete post on Quora. Paste half of it (if it has a good length) and at the end give a Read More option. Connect your site’s URL with this READ MORE. You can also use words like Source, Courtesy, Originally Published On, Via, etc. By doing so, the visitors are directed to your main site and you get more views (ultimately more revenue). Also, add other posts in-between your main post. This will serve two purposes. First, once clicked, you get more views for your other posts. Secondly, your (outbound) links are built. You can also share such posts on Facebook and Twitter and ultimately gain views from those sources as well. Read Next: How to Secure your Blog/WordPress Website?